For decades astrology has centered on the Sun. In ancient times the Moon took a prominent place in an astrologer's toolkit. Now we have a simple program that charts the phases of the Moon and provides general and personal Lunar information for all astrologers with a choice of TROPICAL or SIDEREAL Zodiacs. AstroTides is a captivating program bringing the phases of the Moon to life on your screen. This is ideal for anyone wanting to make plans according to the Moon. You can see up to 100 days at a glance! Options include displaying a calendar or stepping the display screen back and forth in time. The choice is yours! With a click of the button you can view the Moon's phases with details about the Moon and Sun's longitudes, the phase angle, the phase name and the illumination. You can also see the Eclipses. Just set your calendar to the required date and make your plans according to the Moon. This innovative software displays all sorts of phase information in a colourful array of strips. You can choose which strips to display at any time. For instance, astrologers with green thumbs will delight in information about the timing of gardening chores. 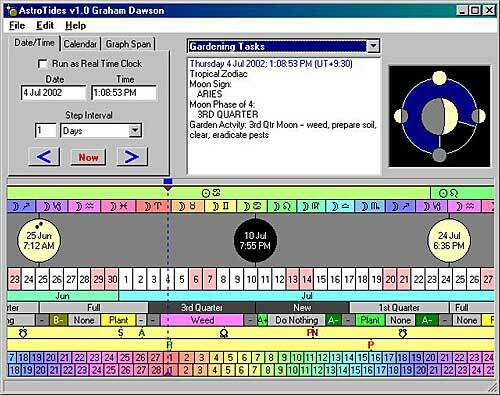 Horary astrologers will enjoy easy-to-use software that shows at a glance the Void of Course Moon. Esoteric Astrologers will enjoy the easy-to-access information about New Moon and Full Moon dates. This is just some of the array of options. A simple colored strip tells you peak and moderately good times to plant above and below ground plants. There will be no excuse for putting off weeding with ideal times for chores such as weeding and eradicating pests highlighted. AstroTides also tells you the ideal time to put your feet up and temporarily leave your gardening. The main focus is to show the position and phases of the Moon at a glance. Therefore anyone who believes that timing is important will be impressed with the array of choices. You can see at glance where we are in the lunar cycle the sign of the Moon, the phase of the Moon, when the next Full or New Moon occurs and when to expect an Eclipse. You can also choose to display strips showing two, four or eight phases of the Moon. Or you can choose all three options at once! The Moon's apogee, perigee, conjunctions to the Nodes can also be selected. This information assists us in keeping in tune with the Solar/Lunar cycle, and in particular by highlighting those periods which are especially conducive to meditating with the purpose of tuning in to the solar zodiacal energies arriving from the Sun's zodiac sign. The "Ageless Wisdom" teaches that, at the time of the Full Moon each month, the alignment of the Earth, Sun and Moon allow an unimpeded influx of zodiacal energy from the zodiac sign occupied by the Sun. A number of the world's major religions celebrate festivals based on or around a Full Moon, such the western Easter festival (based on the Aries Full Moon), the eastern Wesak festival (celebrated on the exact Taurus Full Moon), and the newer synthetic "Festival of Goodwill" (celebrated on the exact Gemini Full Moon). Sidereal and Tropical Astrologers will love the Mansion and Nakshatra strip. The 27 Nakshatras and the 28 Arabic Lunar Mansions can be viewed with brief details about each mansion. Tides consist of the alternating rise and fall in sea level with respect to the land, produced by the gravitational attraction of the Moon and the Sun. The recurrence of high and low water occurs usually, but not always, twice daily. The height difference between high and low water on any day is referred to as the "tidal range". When the tidal range is high, the difference in height between high and low water is greatest. These periods of time occur when the Sun and Moon are opposite one another, or conjunct one another (ie. at the Full or New Moons), and are referred to as "Spring Tides". When the tidal range is low, the difference in height between high and low water is smallest. These periods of time occur when the Sun and Moon are at right angles to one another (i.e.. at the 1st Quarter and 3rd Quarter), and are referred to as "Neap Tides". The information displayed in AstroTides gives a general indication of monthly variations in tidal ranges, and is not meant to be used for accurate daily tide predictions. Horary astrologers can select a strip that shows in colors whether or not the Moon is Void of Course. Anyone who wants to see how the course of the Moon affects them, or their loved ones, personally, can enter some simple personal information and selected the Personal Lunar strip. This tells you when the date and time of your Lunar Return, as well as your Lunar Phase Return. The Lunar phase Return is particularly handy for women who want to discover their fertile time of the month, according to ancient fertility methods. 8 MB of RAM or more is recommended. About 10 MB of disk space for a full installation.